The summer after my freshman year in college, I worked as a waitress at an Italian restaurant. I hated it. I would get so nervous trying to keep my tables covered, making sure I got the orders in correctly (no tomatoes, extra olives, broiled not fried, oh my), and balancing huge trays of food—all vastly exacerbated by a manager who seemed intent on finding fault in everything I did and then pointing it out in a sarcastic tone. I remember shaking so badly sometimes that I couldn’t hold the trays still enough to keep the water from spilling. And then there was the time I dropped a tray heaped with dirty plates, half-eaten bowls of Italian Wedding soup, and—of course—something like 15 Martini glasses and coffee cups. It crashed to the ground, spraying shards of glass, utensils, and pasta bowties all over the floor and around the ankles of a couple off in a cozy, (formerly) romantic nook of the restaurant. It was awful. There were some perks to the job though, including the crusty loaves of bread constantly sitting near the serving stations in warming trays. (I wish I had one of these at home!) We weren’t allowed to eat them, actually, but it seems that after late night shifts or during slow lunch hours, I could count on another waitress or the busboy sneaking one off to a secluded table—out of the aforementioned manager’s view—and sharing a hunk or two with me when I passed by. Of course, we never ate them plain. A small dish of high-quality olive oil and the restaurant’s signature blend of spices was always at the ready for dunking. You can play around with the toppings here for sure. Next time I make it, I think I’ll add thin slices of cucumber or some sort of sprouts or micro greens. It’s also lovely with arugula instead of the romaine lettuce. Have fun with it. I think the dill spread makes great salad dressing, too. I like it best made on this artisan bread (althoug I might make a plain batch, without the garlic and thyme, for this sandwich). Lastly, if you haven’t signed up to follow the blog already, don’t forget to sign up before May 26! If you do, you’ll be entered into a drawing for a $10 Amazon gift card. Special Diets & Allergies: Soy free, nut free, vegan, dairy free, vegetarian. Potentially wheat free if you use GF bread or make it into a wrap on a GF tortilla. 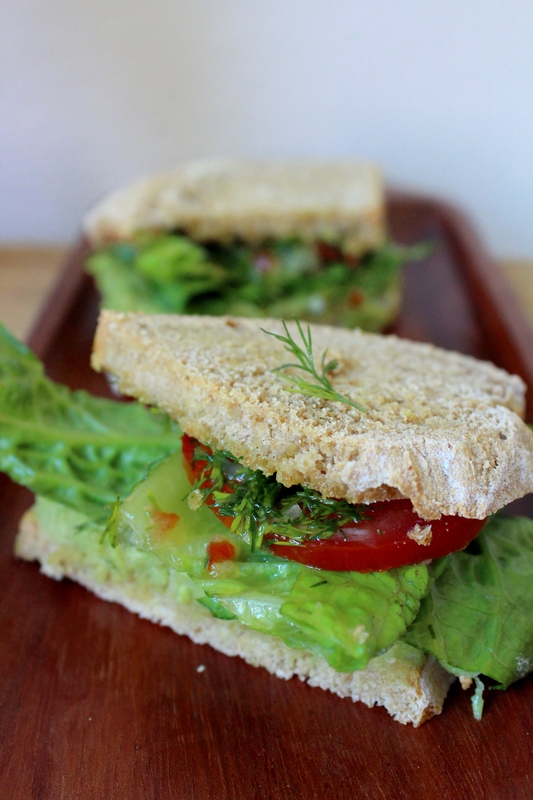 This flavorful sandwich is quick to make and delicious. The savory, olive oil spread soaks into the bread, while scallions and fresh dill add a depth of flavor that nicely compliments the chickpea-avocado filling. Try adding a variety of thinly sliced fresh vegetables to those listed here, such as cucumbers, radishes, or sprouts. 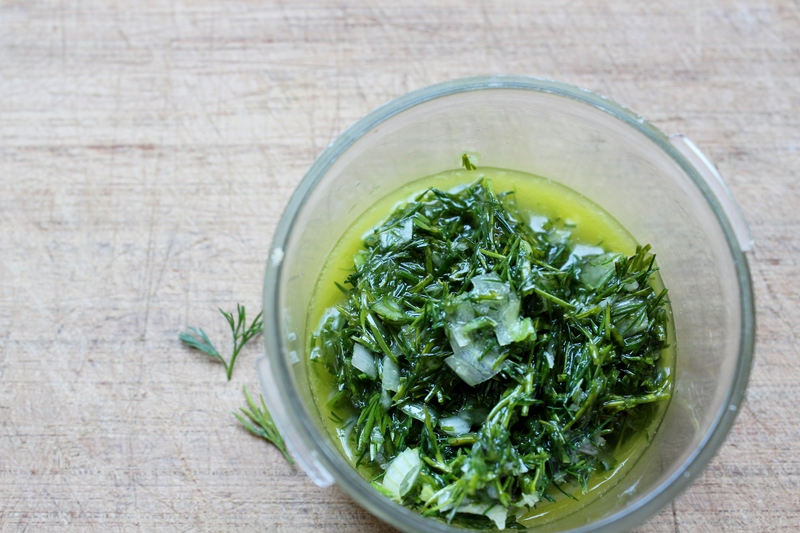 The dill spread can be made ahead of time and stored in the fridge for up to a week. (I store it much longer, but I’m not much of a germaphobe.) The olive oil will solidify in the fridge, though, so take it out ahead of time to let it come to room temperature, or dip the jar you are storing it in into hot water until the olive oil becomes liquid again. Unless you have a very small food processor, you will likely need to double the dill spread recipe in order to get enough volume to grind it up. Never fear; it’s delicious as salad dressing or with pasta, or simply on plain bread. If you don’t have a food processor, you can still make this just by mincing the dill and green onions, mixing the sauce ingredients together, and then letting it sit for an extra 10 minutes or so. A mortar and pestle would also work well here. In a food processor, blend together the dill, salt, oil, agave, and scallions until relatively smooth. Set aside and let sit for at least 10 minutes to let the flavors meld. The longer it sits, the better. Using a fork, mash the beans and avocado together. Add the reserved chickpea juice, 1/2 T at a time, until it reaches a thick consistency that still holds together nicely. If it gets too runny, it will squirt out the other side of the sandwich when bitten. 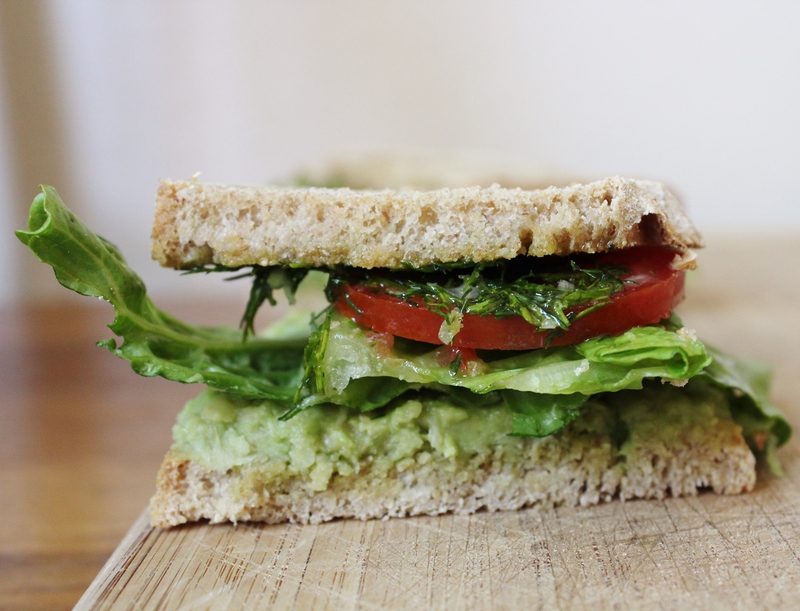 Spread the chickpea-avocado mixture evenly on two of the pieces of bread. Smear the other pieces of bread with a thick coat of the dill spread. Layer lettuce and tomatoes on top of the avocado mixture and top with the other pieces of bread. I hope you’ll make this for me when I visit! Of course! Speaking of which, the strawberries are almost ripe…. So much. Thank you for sending them to me. What a georgous & appetizing good for you sandwich! Yes!